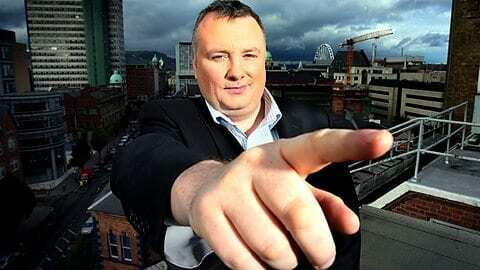 BBC’s Stephen Nolan joins Jimmy’s juggling act! Jimmy Cricket got a well-known BBC presenter to take part in one of his juggling gags live on air. The famous comedian appeared on BBC Northern Ireland’s popular current affairs television show Nolan Live on Wednesday, 3 June. It is hosted by Stephen Nolan, who is often heard on BBC Radio 5 live presenting the station’s evening programme at the weekend. Stephen’s show in Northern Ireland is a mix between topical debate and chat – he holds a panel discussion during one part of the programme, with the other section devoted to talking to a special guest. Jimmy did a short performance during his appearance and was joined on stage by Stephen who helped him with one of his juggling sketches. Stephen then had a short interview with Jimmy, asking him about the contrast between him as a family comedian and other comics who have to resort to more edgy material. “He also asked me what I was up to and I managed to grab a mention of my upcoming national tour with the Osmonds, which is due to take place in December later this year,” said Jimmy, 69.